Prior to the Internet home buyers were entirely dependent on Real Estate Agents for information when looking for homes to buy. The Internet has totally changed this by providing buyers complete access to the entire inventory of available homes thus requiring agents to show all homes to potential buyers for fear of losing a buyer’s trust. The Internet not to mention the REALTOR Code of Ethics ensures agents present all properties without bias, not just their own, for fear of losing a potential buyer. Further proof of this can be seen in the in-house selling statistics illustrated below. 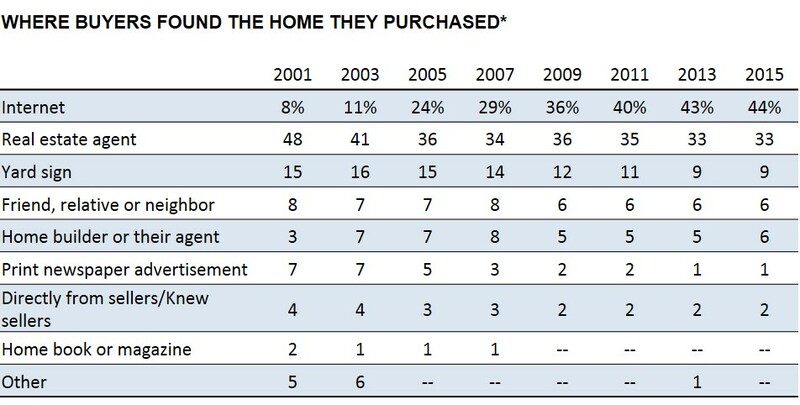 Only 1% of buyers find the home that they ultimately purchase from a newspaper, home book or home magazine and even fewer find their home via an Open House. * Newspaper Advertising and Open Houses typically only benefit the Listing Broker by increasing the Broker’s brand awareness and by putting buyers (who are also typically sellers at some point) in contact with the Listing Broker's agents.